This onion is making me cry.. 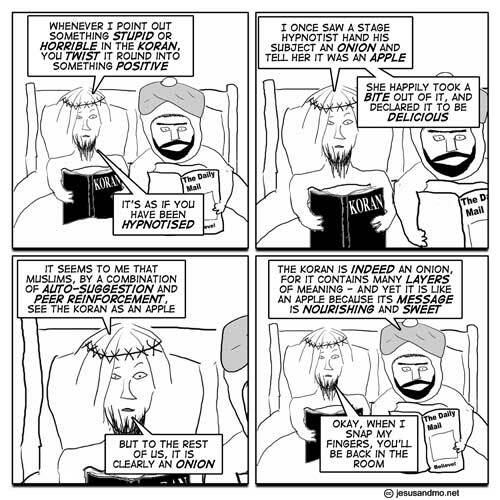 So the Koran is like an ogre? Or like a parfait? Definitely like an Ogre. While to the world it seems threatening and mean, it is kind-hearted when you get to know it. Or something. 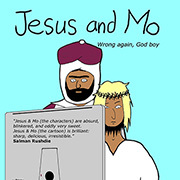 Mo should point out the Book of Joshua (as an example of something stupid and horrible). 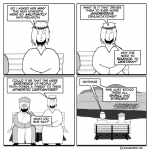 Then point out the Christian belief that Yahweh is a loving god (apple). Then, snap his fingers, clap hands, shake Jesus, shout . . . nothing will work. It’s all context. It’s all good. If only a finger-snap could put a stop to this endless curse of organized religion. I’d be out there snapping it up until my bloody stumps wouldn’t click anymore if I thought that it would work. The bad news is that it’s not going to happen in the near future. I guess the good news is that I won’t have to give up picking my nose any day soon. Why *is* Mo reading the Daily Mail, exactly? It seems the only thing you can achieve by snapping your fingers is causing children in the 3rd world to die. Bono must be stopped!